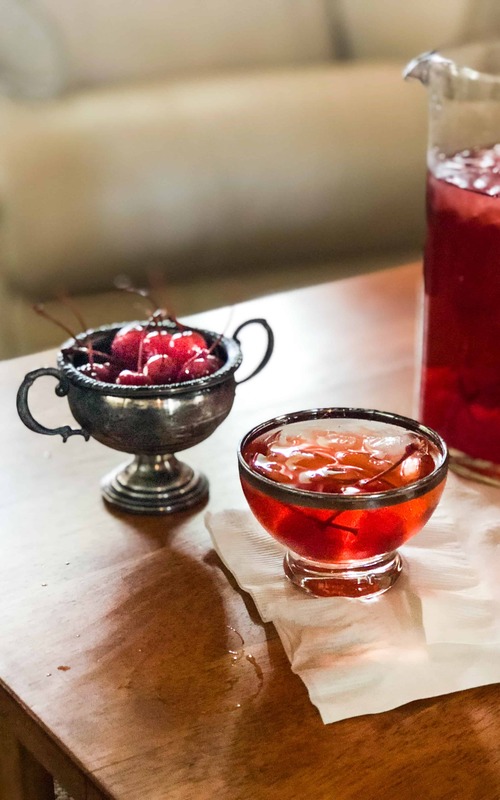 Love the classic Manhattan cocktail? I’ve taken all the flavors and transformed them into a delicious punch for any occasion! Cherry, bourbon, and orange pair perfectly with bubbly sparkling water to make my Cherry Manhattan Punch! These silly sounding ones are currently sitting at the bottom of my list while the ones at the top include the Manhattan, Old-Fashioned, and a Whiskey Sour. Let’s start with the Manhattan because I know Brooks will drink one, or four, with me! Now we can get started with what is actually in a Manhattan? This and other recipes, call for a maraschino cherry garnish but not actually in the cocktail. I have found a few that say a dash of the maraschino cherry liquid helps to round out the cocktail and enhance the fruit flavors. Other recipes call for muddling the cherries in the glass and then adding the bourbon and bitters. Stirred, not shaken! The subject of maraschino cherries is a tricky one. Some prefer Luxardo or frozen/canned cherries but I prefer the good old-fashioned, neon red maraschino cherry for the Manhattan. Now that I have the ingredients down, let’s make it a large batch punch! 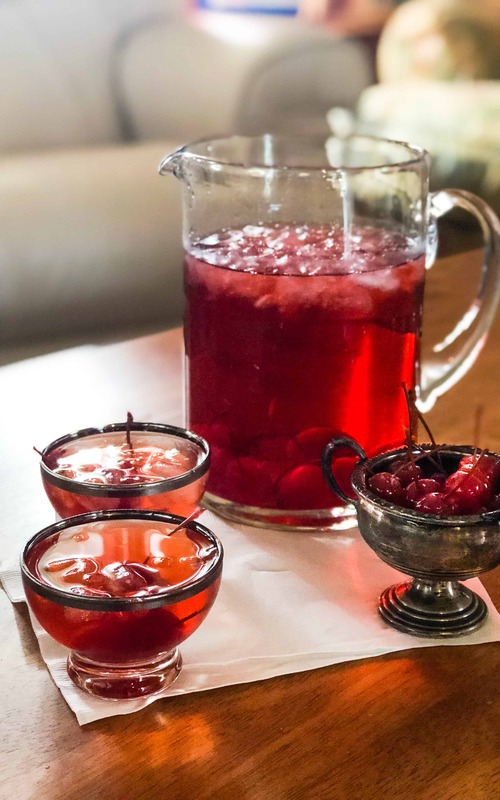 I tried making this Cherry Manhattan Punch with plain cherry juice and orange sparkling water to keep the calories and sugar down, but it just didn’t turn out right. The sugar from the maraschino cherry did the trick. You can use the juice instead of purchasing a separate bottle of grenadine. All the flavors of the classic Manhattan cocktail, in a large-batch, beautiful red, punch full of plump cherries, caramel bourbon, and bright, orange sparkling water. It is so much better for your wallet if you serve punch instead of individual cocktails! Much like having a signature cocktail or only serving a few choices of wine or beer, people are going to drink what you have available. That being said, if you are hosting a “Cocktail” cocktail party you need to have all the ingredients available for classic cocktails. If not, serve punch! Here are a few of my faves that can easily be made into mocktail punches if you need to. A cool Manhattan cocktail can be served as a party punch too. 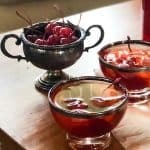 My Cherry Manhattan Punch is perfect for any party and is full of bright cherries and caramel notes from the bourbon! Love the classic Manhattan cocktail? Cherry, bourbon, and orange pair perfectly with bubbly sparkling water to make my Cherry Manhattan Punch! In a large pitcher, combine the grenadine and bourbon. Add maraschino cherries for garnish. 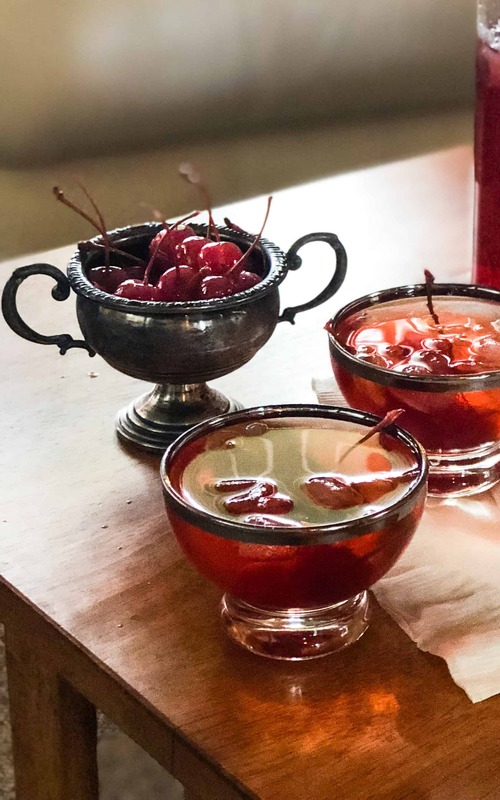 *If serving in a punch bowl, you can make an ice ring out of orange sparkling water and cherries to make a pretty display. *For best results, chill the grenadine and sparkling water ahead of time. Freaky Friday was started in 2015 by Michaela over at An Affair From The Heart who is known for her Award Winning Crack Dip and so many sauerkraut recipes I can’t even count them all! 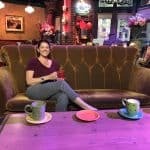 If you haven’t heard of Freaky Friday before, it’s a blog swap where we are secretly assigned another person’s blog and we pick a recipe to make. Then on the specific Friday, we all post and see what each other made. This round I was assigned to the blog Who Needs A Cape? which is run by Lori and Heather. They don’t wear superhero capes or try to be super moms. I love that they share real mom life struggles all while making great food! When trying to choose what to make from their blog, I started by looking at their appetizers of course. Once I started scrolling through them I couldn’t decide between their Spicy Green Olive and Feta Tapenade, Pineapple Cheesecake Dip with Toffee Pretzels, or the Loaded Cheeseburger Dip in the slow cooker! I decided on a different approach: Cocktails. This wasn’t easy either but when I saw their Sweet Manhattan Fizz Cocktail I knew I had to make it into this Cherry Manhattan Punch. Brooks will drink it too! Check out their extensive list of Christmas drinks for kids of all ages! Is there a way to incorporate some sweet vermouth into the recipe? I have some on hand so it would be nice to use it in the recipe and add some more booziness. Yes, you can! I would start with 1 ounce of it in the whole batch of punch and then slowly incorporate it. To keep the ratios of the original Manhattan, you can add up to 4 ounces. Let me know how it turns out! This looks incredible, I love the color too, so pretty! Cheers! This drink would be so perfect right now after moving my stuff today!! I think I know what I am making in a few minutes!!! I cannot get over how delicious this cocktail sounds!! I am so intrigued!! Super versatile and I know it’s going to be a HUGE hit at our next party! Thanks for sharing a large batch like this. Brilliant!! Who doesn’t love a great Manhattan cocktail? Guess I will start drinking these with my dad! He’s a big bourbon fan too! Smart move making a large batch of this delicious drink! Glad you enjoyed browsing our site and choose a fun recipe for Freaky Friday! Looks so refreshing! I love the color! Fabulous for parties! My step mother would LOVE this!! She eats maraschino cherries straight from the jar. I love your posts… I spit my tea up reading about what you thought about a Harvey wallbanger…. Punch is what Im making for our pool party next weekend! Thanks for the great ideas! I haven’t had a Manhatten in EONS! We just picked up a pint of fresh cherries at today’s Farmer’s Market – guess what we’ll be having for cocktails later this afternoon?!!! Thanks for the delicious inspiration. How tasty!! I have almost everything to make this cocktail! Cant wait to make it- I think it’ll be a big hit with our friends and family!